This is one nice looking men's wedding ring, offering a distinctive look to a wide wedding band. 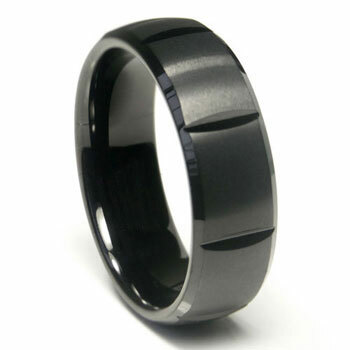 The manufacture of black tungsten has led to truly striking rings and wedding bands that have the expensive feel of silver, gold, and platinum but are very practical for most budgets. The overall profile of this ring is dome and it has a brush finish top. The grooves that go around the entire ring and the beveled edges are high polish finished. This is a great ring for those who work, and play hard. Another great feature of this men's wedding band is that it will not smash, crush, crack, or break. All of our wedding bands are covered by a 100% lifetime warranty.